TO MESOAMERICA AND MISSISSIPPI VIA MESOPOTAMIA, THE INDUS VALLEY AND EUROPE; CONTINUOUS SURVEYORS LANGUAGE AND MEASURES EXIST ACROSS THE WHOLE LANDSCAPE. When Professor Alexander Thom and his son Archibold S Thom with the Merrick family surveyed and postulated a theory that the standing stone circles and Timber Henge of Britain and Europe were set out to regular measurements and geometrical form, both Archaeologists and Historians threw their hands up in horror. The historians would not accept that megalithic man had any necessity to utilise measurement on a regular basis, and a well known Archaeologist wrote to me saying he would not accept this evidence until he excavated a measuring rod. Both sets of peoples wrote papers concerning the ideas put forward as non-sensical and then even mathematicians and statisticians joined the fray. But to my research they are out of order! Now that proper research has overtaken the hysteria and such papers which purported to show megalithic man only knew a very few set of numbers have been shown to be totally wrong, I thought it time to complete the research into the world wide phenomena of a standard measurement. My Ms3 paper commenced this research and indicated it was based upon a single geometric fact, that the 30/60/90 degree triangle was the simple expression of three megalithic measures which originated in Mesopotamia, pre 3000BCE. 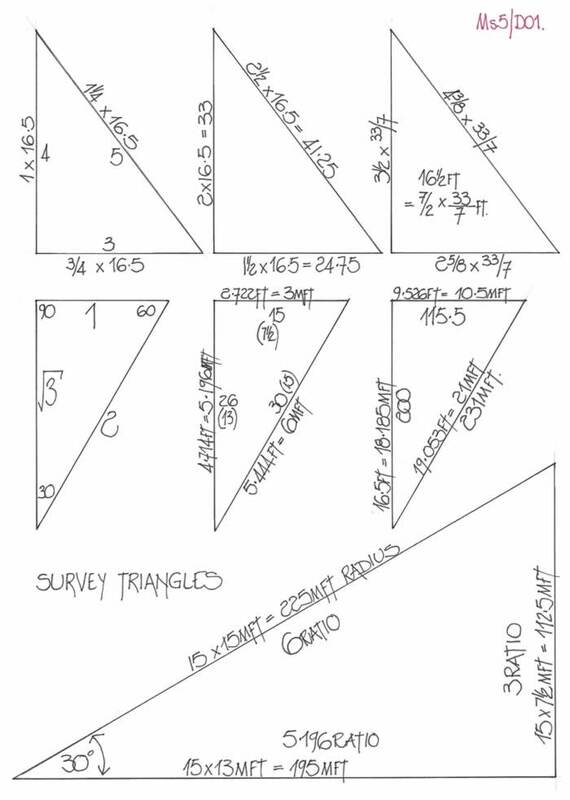 Prior to this explanatory text I have decided to fully explain the simple survey triangle and its megalithic measurements, thus obviating the necessity of repetitive annotation. 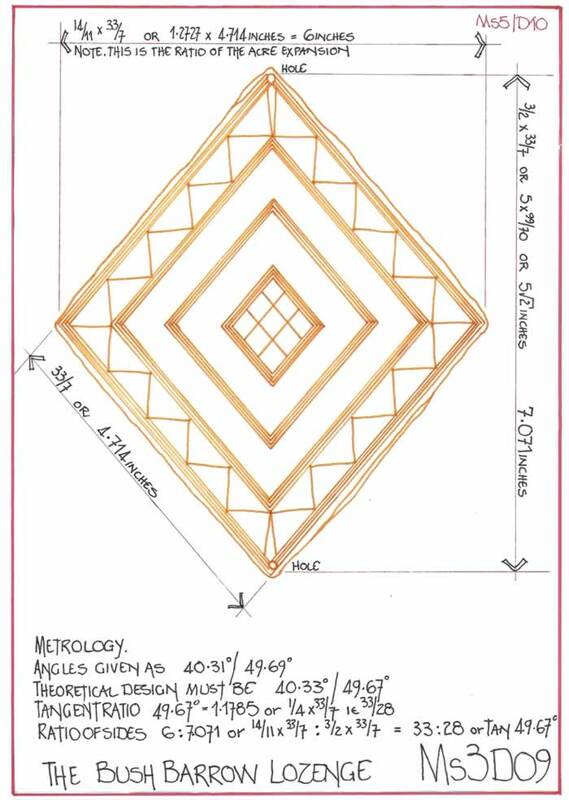 The basic measurements of the survey triangle are 2.722 feet/4.714 feet/ 5.444 feet which can be expressed as 3/5.196/6 megalithic feet of 10.888 inches. Thus the lengths are 32.664/56.5714/65.328 inches or 829.666/1437.022/1659.332 mm, with the megalithic foot being 276.555mm. The 30/60/90 degree triangle is of course based upon the ratio 1/√3/2, and thus the actual √3 ratio can be expressed as 40√2 inches, which is 40 x 99/70 inches or 33/7 feet. At this point it is worth reminding all that √2 is 99/70, PI is 22/7 and with a measurement of 33/7 it is possible to express each as a factor of the other (see Ms3 etc), such that 10/3 x 99/70 = 33/7. But more importantly as all are ratio units they can be any unit length, not necessarily feet and inches, and thus we obviate the necessity of knowing just what actual named length megalithic man used as a basic measurement. But more importantly the 3/5.196/6 ratio can be expanded with no loss of accuracy to either 7.5/13/15 or 15/26/30; so very important in the later usage of these measures. At Tepe Gawra, northern Mesopotamia, some 15km north-east of Mosul, Iraq, is an Ubaid Temple complex consisting of three conjoined buildings around a courtyard. The northern temple has been surveyed and the basic measurement given as c720mm. The measurement was called by the surveyor the Ubaid Cubit and the building is quite precisely 12UC x 16UC with a diagonal of 20UC, making the whole setting out 3: 4: 5. The bricks used for the building are ½ UC by ¼ UC by 1/8 UC, i.e. 360 x 180 x90 approx and thus have the proportions 1: 2: 4, a ratio which will soon feature again. The Ubaid Cubit is therefore nothing more than the fore-runner of the Megalithic Cane of 1437.022mm, the half being 718.511mm. But of course the temple is actually 6 megcanes/ 8 megcanes/ 10 megcanes of 4.714 feet, the part of the survey triangle, 3; 4; 5. It can also be expressed therefore as 20√2 inches, half of the 40√2 measure of 4.714ft. Professor Berriman then discusses the two basic measures of the region, the Assyrian Shusi of 0.648 inches and the Sumerian Shusi of 0.66 inches, which gives rise to the Sumerian Cubit of 19.8 inches, i.e. 1/10th of 16.5 feet and the Sumerian foot of 13.2 inches or 1/15th of 16.5 feet. But, of course 16.5 feet = 198 inches = 3 ½ x 4.714 feet, the megalithic cane. 10.888 = 16.5 Sumerian Shusi, and thus the megalithic yard of 32.664 inches is either 49.5 Sumerian Shusi or 50.4075 Assyrian Shusi. The information on the Babylonian measurements made in 1853 are contained in; “L’Etalon des mesures Assyriennes fixe in 1853 par les texts cuneiforms”, by MJ Oppert, Journal Asiatique, August/September 1872 and October/November 1874. Just to be clear the figures are really too close to call; 50 x 0.648 = 32.4 inches and 50 x 0.66 = 33 inches, with 1/50th of 32.664 inches being 0.65328 inches. Can you adjudicate? Nippur foot = 276.43mm, but obviously 276.55mm, a megalithic foot of 10.888ins. The brick sizes can be rationalised to 350mm and 280mm, with drying shrinkage allowed. west side = 472 inches and the east side = 471 inches. This relatively accurate layout for the brickwork and the slight discrepancy is amply atoned for by the careful finish of the masonry- a finish so good that the writer has not seen it equalled in any ancient work”. In my Ms3 text I questioned the word “discrepancy”. It was obvious that the two sides were in fact 471.4 inches or 100 megalithic hands and thus the ends are 58.33 and 59.5 meghands respectively. But 275 + 280.5 = 555.55 inches, which is 17.0065 megalithic yards, and it is therefore open to propose that the ends should have been 277.5 inches or 8.5 megyards each, or that the total measure of 555.55inches is very significant to them. Thus it is possible to opine that at Harappa and Mohenjo-daro the Sumerian/Akkadian measures which had become the Megalithic Measures were used in these constructions. My previous paper Ms3, commenced with a discussion regarding the Sarn Y Bryn Caled Timber Circle, dated to around 2100BCE.It is a simple example and I will quote it. Hidden in the landscape adjacent to the A483/A490 road junction is a complex of landscape works dating from c2100BCE. The site comprises a Timber Circle, Penannular Ring Ditches and a Cursus. 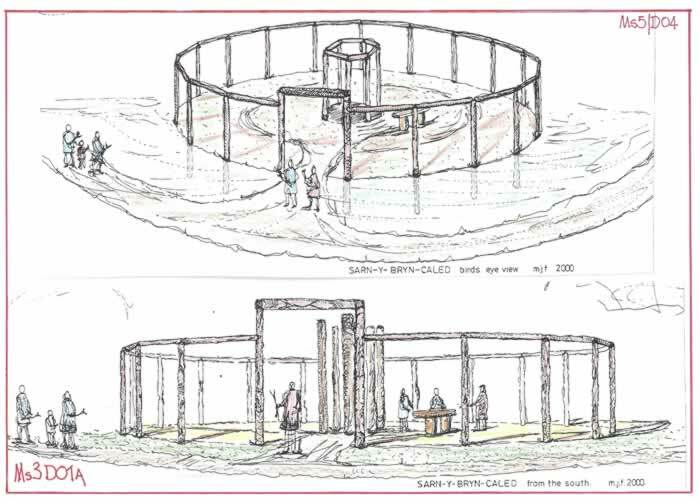 Our interest, the Timber Circle, comprises 20 posts set in large holes with an inner circle of 6 posts and a small separate 2 post unit. To obtain the circularity commented upon by the original authors, the post- hole pits had to be located by a survey setting out. But, were the positions of the posts themselves marked upon the ground and large holes dug, thus hopefully the hole in the ground would be set out symmetrically about a fixed point; or, were the holes just dug and posts inserted to attain a near circle. The site evidence is ambivalent, but, the circularity of the final layout is not. It is a circle. The investigations carried out in 1991/1992 indicate a surprising accuracy in the original excavated depth of the post holes. They are as follows; 17 bottom levels (given as readings to the site datum level) between 70.61 to 70.66m, a variation of c50mm; one is at 70.76 and two special posts are at 70.53 and 70.57m. Thus, it was shown by the survey that there is an average depth of c1.45metres below original ground level. The Sarn Y Bryn Caled circle has a diameter of c18.3m. This is also a near exact 60 statute feet (18.288m), a surprising dimension indeed. Thus perhaps we should reconsider each of the dimensions in statute measure, the precursor of our imposed metric system. The statute system, based as it is on natural elements such as the Barleycorn etc., surely has a greater affinity to any possible megalithic measure than the manufactured metric system can ever have! The equivalent of c1.45m is c4.75ft. 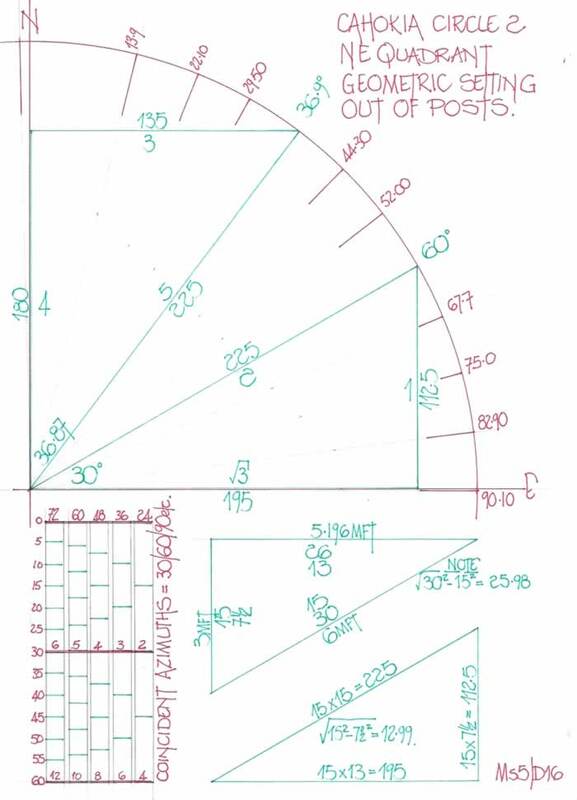 Thus we can carry out a mathematical check calculating the spacing of the 20 posts with a circle diameter of c60ft. The answer is c9.5 ft. In other words, the posts were 3 x c4.75ft long having 2 x c4.75ft or c9.5ft above ground level and they are spaced at c9.5ft centres around the circumference. Therefore at Sarn Y Bryn Caled in c2100BCE we have evidence of ancient man utilizing measures for post length, excavation depth and spacing around a circle. And that circle just happens to be c60 statute feet in diameter. 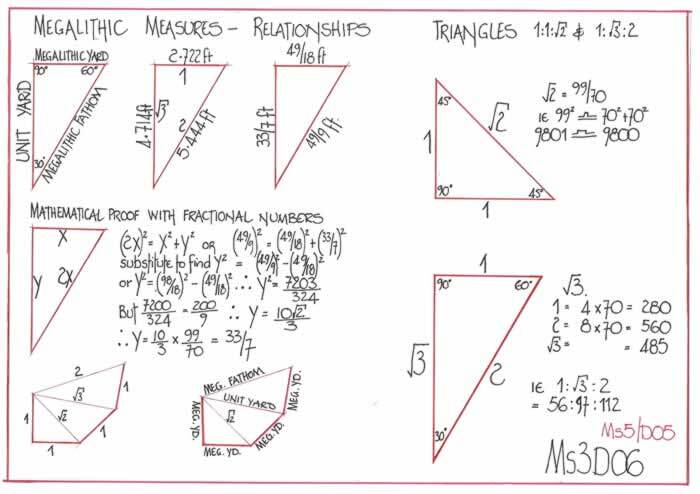 The measurement is thus the √3 section of the 1/√3/2 triangle of 30/60/90 degrees. The measurement of 4.714 feet was also found at Smalanadsstenar, Sweden where the basic setting out of the stones is a 3; 4; 5 ratio. The Bush Barrow Lozenge, a gold artifact has side lengths of 119.5; 122; 121; 122mm but, 119.75mm equals 33/7 statute inches the twelfth part of the Megalithic Cane of 1437mm. The other many examples are within texts Ms2, Ms3 and Ms4 on the website. Thus far it has been shown that from 4000BCE to 2000BCE a constant measurement was in use and the same survey methodology which commenced in Mesopotamia has carried through the adjoining lands and thence to Europe. But it is worth remarking at this point that in China, the Ch’ih is a measure of 10√2 inches and as such is part of the system described above, being one quarter of the Megalithic cane of 40√2 inches. Thus the measurement went east as well as west in antiquity. Chichen Itza, originally founded by the Mayan Itza, was then taken over by the Uta Aztec family, part of the Toltecs from the Mexican valley, who were excellent sailors. 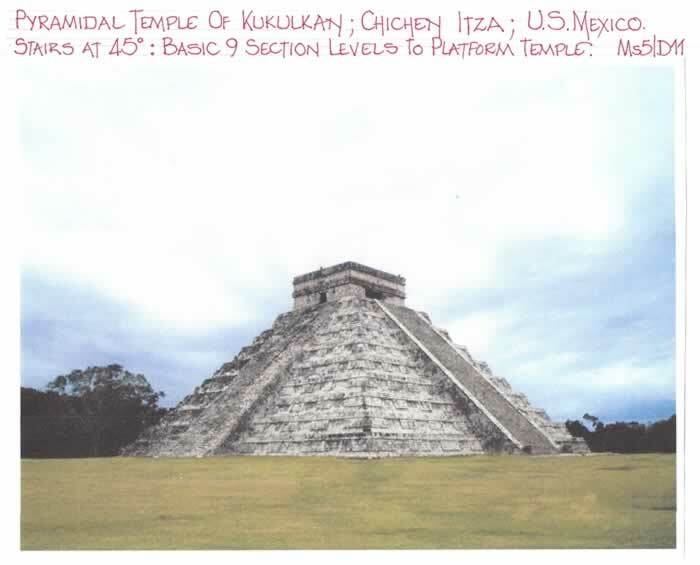 Chichen itza- the city of the water magicians- has the excellent pyramidal structure, the Temple of Kukulkan, which is Mayan/Toltec and is built on survey measurement principles using both the 1;1;√2 and 3;4;5 base triangles. The actual base measurement is given as 55.3 meters for which 200 megalithic feet equals 55.311 meters. 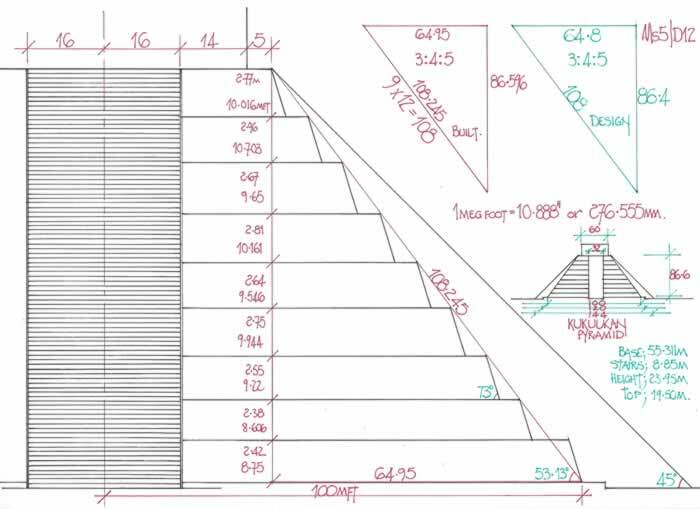 The height of the pyramid totals c23.95 meters, which is set out by a 3;4;5 ratio and gives a slope length of 108.245 megalithic feet, and as there are 9 levels it is logically 9 x 12 = 108 megalithic feet. The four staircases are built at 45 degrees slope and are given as 8.85 meters wide which is precisely 32 megalithic feet. Thus we may assume that the megalithic foot is prevalent in the construction and measurement system of the Maya/Toltecs. Therefore by a simple evaluation it can be shown that the ancient metrology and survey methodology travelled to the America’s long before historians have conceived possible. 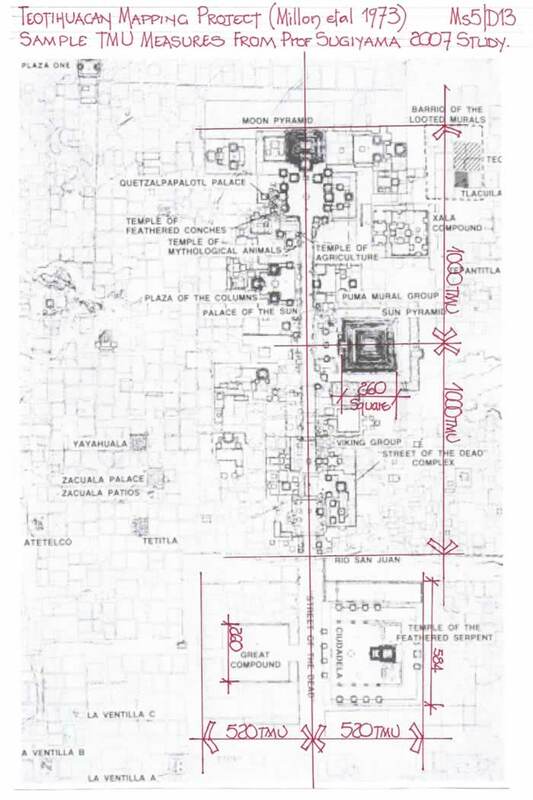 In 2007, Professor Saburo Sugiyama carried out a complete measurement study of the Teotihuacan complex and concluded that the basic measurement was c83 cms, which he named the Teotihuacan Measurement unit, (TMU). But the Megalithic Yard is 829.666mm consisting 3 megalithic feet of 10.888 inches. But 260 x 2.722 feet (829.666mm) = 707.72 feet which is virtually 500√2 feet (500.434) or 780 megalithic feet of 10.888 inches, that is 3 x 260, obviously. The megalithic foot is 276.55mm and the megalithic yard is 829.666mm, the TMU. 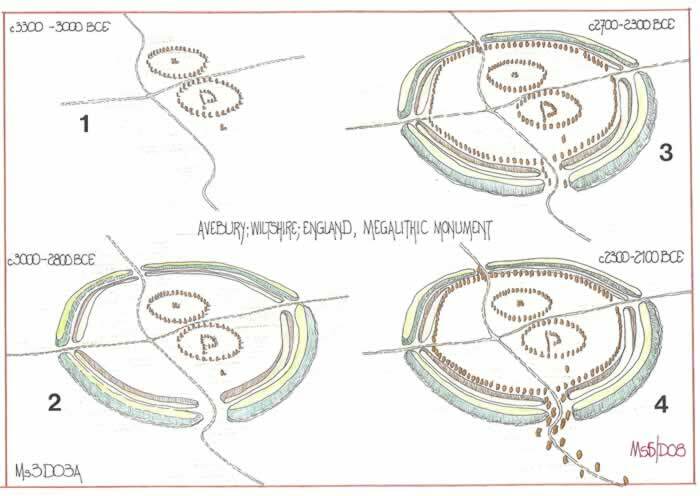 Extending along the Mississippi River valley are a series of c120 earthen mounds and other constructions which include Timber Post Circles. The best known site and the largest is at Cahokia, which has been extensively surveyed and analysed. However there are various theories as to the origins of these peoples who constructed some marvelous and awe inspiring mounds, but as they appear to be pyramidal in form, perhaps the Gulf of Mexico and its various peoples, including the Toltecs who were good sailors should be considered their antecedents’. After all distances around the coast are not great nor is it difficult sailing to the Mississippi delta. This mound was subject of an archaeological survey dig by Harriet H Smith of the Field Museum of Natural History, Chicago, and the findings were published within the text, Explorations into Cahokia Archaeology, edited by M L Fowler and published by the University of Illinois. 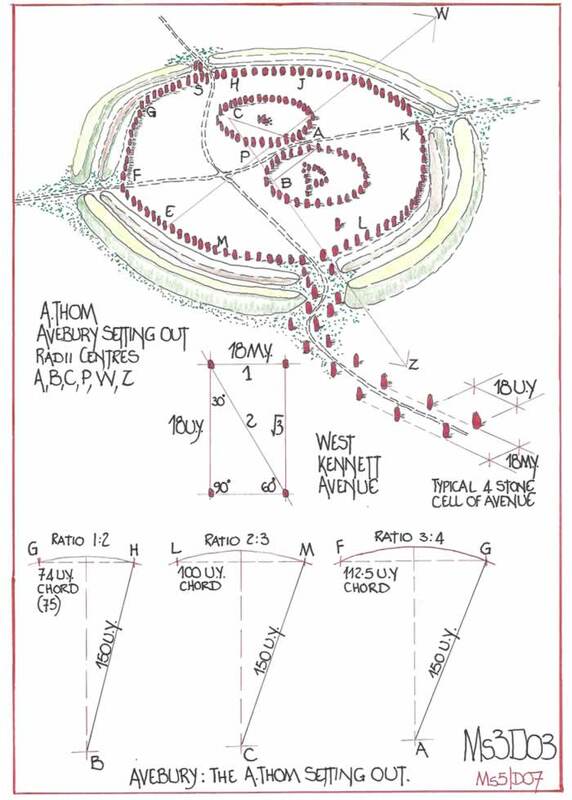 There-in pages 49-87 detail the Murdoch Mound and its reconstructed measurements. 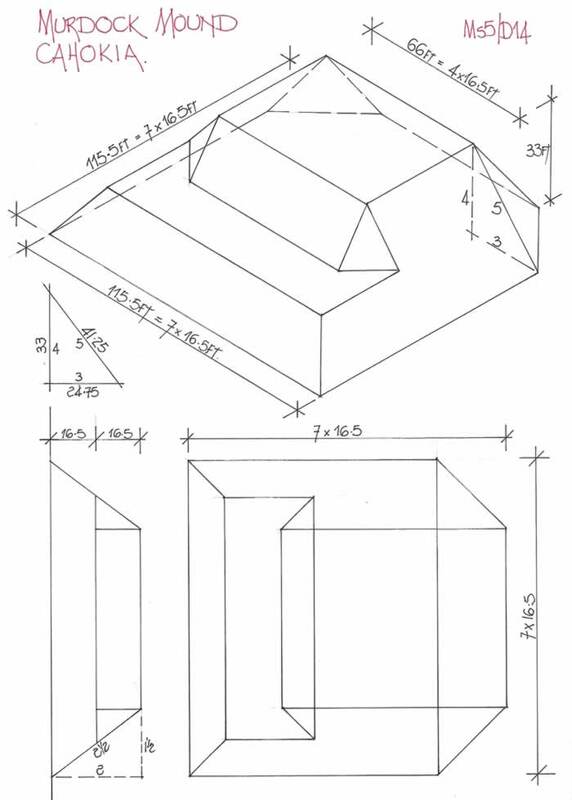 The basic unit is 16.5 feet, with ½ and ¼ units also used, but importantly it is set out using a 3; 4; 5 ratio triangle to form the sloping sides as the diagram illustrates. That is the same methodology as found at Chichen Itza and Mesopotamia. However, 16.5 feet is also 3.5 megalithic canes of 4.714 feet and thus the sides of the triangle are actually 9.9; 13.2 ; 16.5 feet or 2.1; 2.8; 3.5 canes, which of course brings the number 7 into the equation and the mound is 7 megalithic canes high, at 33 feet. 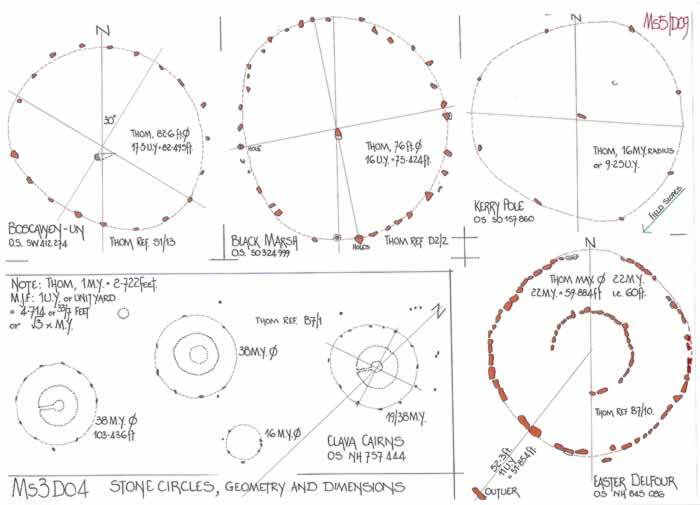 Warren Wittry et al, conducted an excavation at Cahokia starting in the 1960’s and found five such circles. One circle in particular was found to be nearly complete, but, there were no pits for the posts at the geometrical centres as proposed. This indicates that if a proper radius rope was used the centre post was probably a minor peg leaving no earth mark. 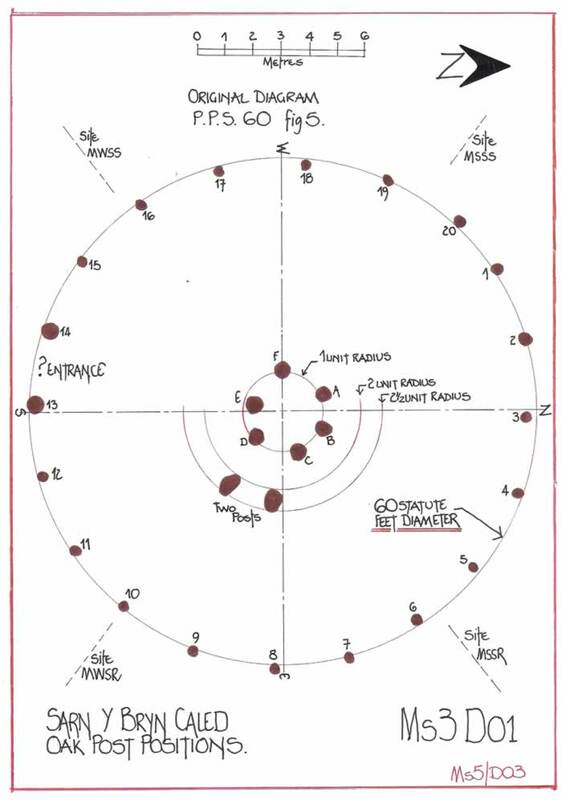 Thus the circle centres were generally calculated by Wittry and the post pit co-ordinates were found in W Wittry’s notebook along with his identification information and calculated results. I have used the excellent paper by Professor Michael Friedlander, published in the “Wisconsin Archeologist”, 2007, 88(1); 78-90. Entitled, “The Cahokia Sun Circles”, where –in are transcribed the original notes and co-ordinates which I am using for diagrams. Therefore, if we draw the data provided by the co-ordinates an assessment apropos the possible Mississippian measurement system can be made. The first diagram illustrates Circle 2, set out noting only the putative azimuths and radii with interval degree measures added. I have set it out quadrant by quadrant to expose the methodology of the construction. Why? Very simply there are 48 posts which appear to accord with the notional circle and thus 7.5 degree spacing should be noted, but it varies from 7 to 8 degrees. If the NW quadrant is studied it can be seen that the 48 Post, which should be Due North is in fact 1.3 degrees west of north and thence the next 7 Posts going west are obviously set out from Post 48, not Due North. Unfortunately Post 1 is missing, but, Post 2 is located at azimuth 13.9 degrees and is thus 15.2 degrees from Post 48. 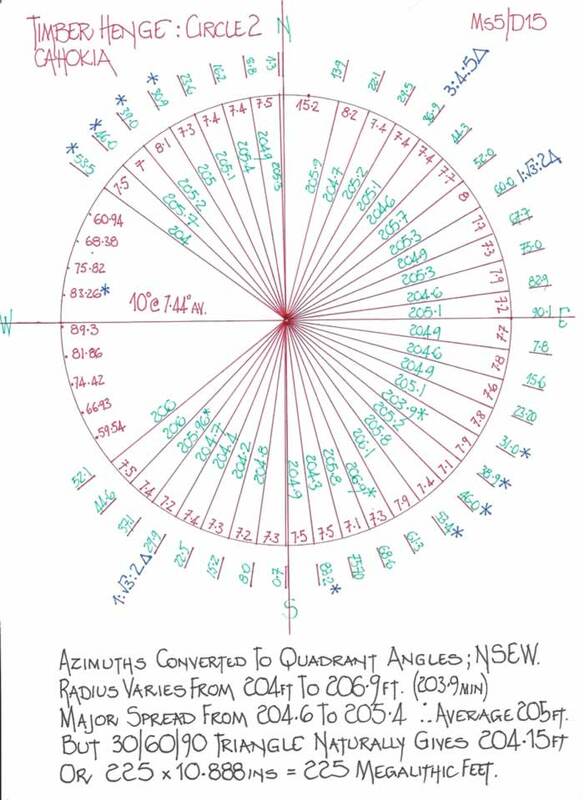 It is not until Post 8 to the east, that the correct azimuth is gained at 60 degrees. But it is followed accurately by 67.7 (67.5); 75; 82.9 (82.5); and 90.1 (90). That last post may be considered to be Due East. The south Post is 0.7 degrees west of south, but the Post at Due West is now missing being destroyed by construction works. 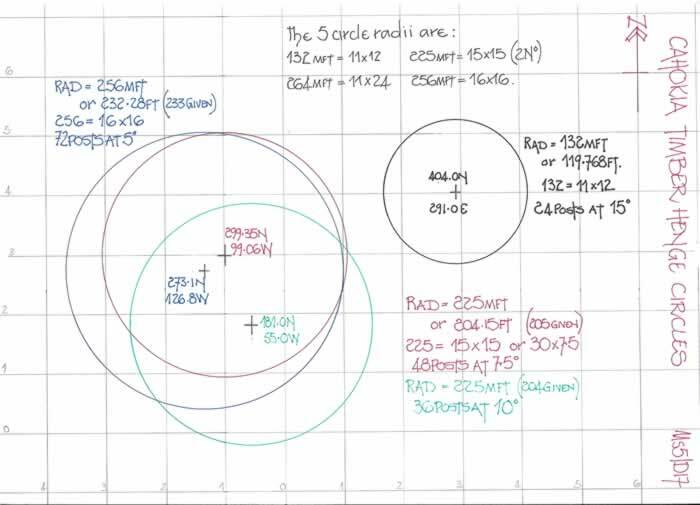 Before discussing the probable Radii I draw your attention to the fact that another circle, this one having 36 Posts has a calculated radius of 204 feet, where-as Wittry calculated 205 feet for Circle 2. The second diagram illustrates the fact that Post 5 is set at azimuth 36.9 degrees and Post 8 at 60 degrees. Both of these Posts could be set out geometrically from a centre point using firstly a 3; 4; 5 triangle and secondly a 1; √3; 2 triangle. But the over-riding fact is that in the original Megalithic 30; 60; 90 triangle it was made up of 3; 5.196; 6 megalithic feet which can be rationalized to either 7.5; 13; 15 or 15; 26; 30 without loss of accuracy as the figures illustrate. Thus it is open to the proposal that the actual radii of the two circles is a multiple of the 30; 60; 90 triangle ratio of 7.5; 13; 15, which can be enlarged by a factor of 15 such that the radii is 225 megalithic feet which is actually 204.15 feet and suits both circles. Firstly they are constructed with multiples of 12 posts; that is, 24; 36; 48; 60 and 72 posts and the third diagram illustrates the setting out of 4 circles, the 5th having no co-ordinates available to evaluate an exact position. These radii can be rationalized to Megalithic Feet of 10.888 inches or 276.555mm. If the number of posts and their spacing is tabulated then the coincident azimuths for all 5 circles occur only at 30 degree intervals, i.e. 30; 60; 90 etc, which allows the Megalithic Triangle, with a multiplier for the 132 radius, would be 132; 114.315; 66 and thus for the 264 radius obviously twice the units at 264; 228.63; 132. The 256 radius is 256; 221.7; 128. Finally Warren Wittry found a post hole some 5.76 feet from his putative centre for Circle 2 which he determined as the alignment post for the summer solstice which will be found close to 60 degrees, the post 8 position. Thus on the 21st June 1000AD the sunrise is seen over the eastern ridge at a height of 121 feet and 23800 feet distance with a horizontal altitude of 0.29 degrees. The solar reading is, Solar Declination 23.56; Solar Azimuth 59.00 degrees; Solar Elevation 0.29 degrees, a matching set of figures, and thus the observers post is correctly positioned. However, there is one simple question to be answered; why was the timber post circle not set out to this sunrise? Obviously the surveying and dimensional requirements were far more important than the solar alignment, when a minor adjustment could be made for the viewing point. 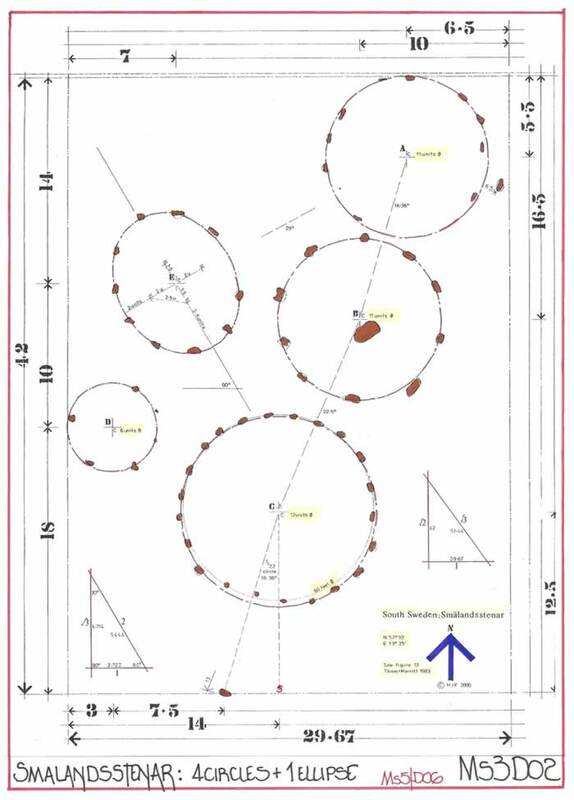 Look at the positions of the circles, they all require special posts, even though in theory they would have a post at N60E and could have been properly aligned, but they are not! I therefore conclude this was a measurement surveying exercise, not sunrise. 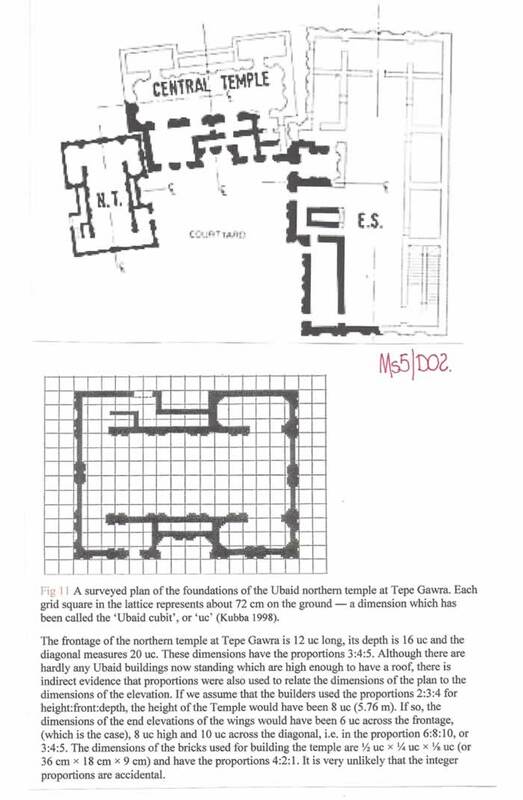 I was asked by the editor of Survey Review to prepare a text originally gathered together by M A R Cooper, entitled “Land Surveying in Mesopotamia: Ethical Algebraic Geometry” (Survey Review, 2013, Vol45, No333, pp 399-409.). I am quoting from that text which I believe sets down the origination of surveying. The fourth period, known as the Neo-Sumerian period, or Ur III dynasty, lasted from 2113 to 2000 BC. 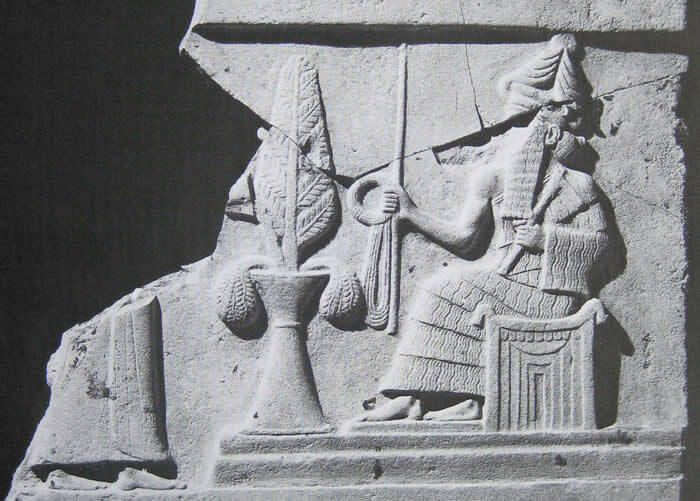 The final period in this account is the Old Babylonian (OB) period which lasted from 2000 BC to 1600 BC. Most of the evidence of Mesopotamian land surveying comes from this period. In most early cultures religion plays an important part in day to day life and it tends to develop before the populace is literate and before many useful occupations. Thus land surveying and mathematics were more than useful practices as the scribal curriculum included the writing of hymns and myths, some of which related how mathematics and measurement of the land were handed down by deities to kings as symbols of truth and justice. Fig 2, is part of a fragment of a stele1 dating from around 2100 BC during the Ur III period. It shows the moon god Nanna-Suen presenting a surveyor’s measuring rod and coiled measuring line to King Ur-Namma2 who is pouring a libation into a potted plant. Fragment of the “Ur-Nammu” stele now in the University of Pennsylvania Museum of Archaeology and Anthropology. She makes them (the wedges) sparkle with a golden stylus. With joy, righteousness and femininity, Nisaba brings wisdom, knowledge and order for the king to use for the benefit of his subjects. She and the marks she makes in the clay ‘sparkle’. The lapis lazuli of the measuring rope represents the sparkle of the oiled measuring line, glistening in the sun as it is pulled across irrigated fields. The king is given these divine symbols of numerate justice. Thus we can be certain that surveying and geometry played an important role in the lives of the Akkadian and Sumerian peoples. This is the “Fertile Crescent” where agriculture and literature through the ability to write in cuneiform developed and thus the foundations of civilisation laid down. This knowledge travelled both westerly and easterly as can be seen from the usage of the same measurements and geometry in Europe, Pakistan and China. But for these same measurements to be found in Mesoamerica indicates that during the first millennia BCE voyages between the western land mass and the America’s must have taken place to transfer the measurements so precisely. We can scoff at the Mayan folk memory of fair haired visitors, but obviously some peoples made the journey with enough knowledge of surveying and geometry to impart the ideas to these Mesoamericans. They are too accurate for local development to occur, as the indigenous population are small in stature for a foot length of 10.888”. In the first millennia BCE, the peoples of the Levant, the Phoenician’s moved west and founded Carthage from which they sent out voyages of exploration beyond the Pillars of Hercules. The Carthaginian Admiral Hanno sailed south around the bulge of West Africa to Mount Cameroun, the active volcano and then south to Gabon. Thus it is not a huge step in logic to suggest instead of a voyage turning east it turned west, ended up in the Gulf of Mexico and the Yucatan peninsula. Proof, none, as Carthage was decimated by the Roman Legions and it is only by luck we have the details of the Hanno voyage. But Roman writers also documented the voyage of Himilco, another Carthaginian, to the northern reaches of Europe, and thus perhaps it is not so great a leap in logic. Therefore, I can state quite plainly that to most parts of the world the original Mesopotamian measure of 10.888 inches has been transferred and used, along with its larger multiples. How, is a question I have tried to answer, but other possibilities exist. M J Ferrar December 2016.